"Everywhere and Nowhere" is a classic plot which, due to the difficulties in performance, is rarely seen. The original version calls for exceptional aptitude in card-changes which are not the easiest sleights to do well. Here is a new method utilizing a well-known fake pack that surely you already have, used in an undetectable way. This routine brings "Everywhere and Nowhere" within the range of everybody. 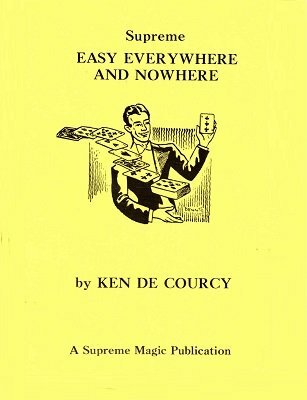 Give it that and you'll have a trick that will amaze and entertain both laymen and magicians. A card is selected from a pack, then returned and the deck is cut a number of times to lose it. The magician removes the top card, shows it and asks if it is the chosen card. It isn't so the card is laid face down on the table. A second card is shown. This, too, is not the chosen card so it is placed face down alongside the first. A third card is shown, denied and laid with the other two. Says the magician, "I can't understand it ... I've always managed to find any card within three tries". He picks up one of the cards and shows it. "You did say this wasn't your card?" The spectator now has to admit it is his card. The card is replaced face down on the table. The second card is lifted and shown. "If I remember, this wasn't your card either?" Once again the spectator has to agree it is now his card. This card is replaced face down on the table. The third card is picked up and shown. "This wasn't yours either, was it?" But now it is. It's laid down with the other two. Continues the performer, "Well, at least we've established one thing. Your card was the ... of ... What puzzles me is why you thought these three were your card ... because, as you can see, they're all different ... and not one of them is the ... of ..." The three cards are turned face up; they are indifferent cards. "The other thing that puzzles me is how you picked the ... of ... in the first place, because that's the one I always carry in my pocket!" The magician reaches into his pocket with an obviously empty hand and pulls out the chosen card! 1st edition 1981, PDF 7 pages.